Businesses renting mopeds and scooters have been increasing in numbers in major cities across the United States, including in the state of Texas. As the utilization of rental mopeds and rental scooters increases in cities like Dallas, Fort Worth and the surrounding DFW metropolitan area, the potential for accidents also increases. 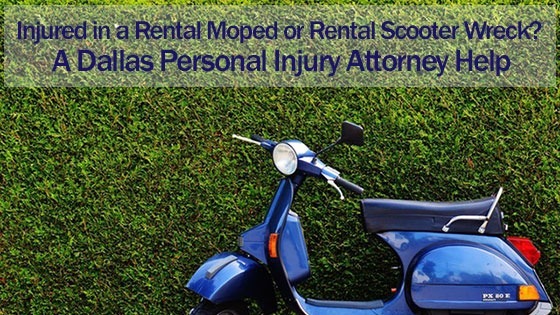 If you or a loved one is injured in a moped or scooter accident you should immediately contact a Dallas personal injury attorney from the Law Offices of David Kohm. Driving a moped or scooter can be an enjoyable experience. However, if you unfortunately experience a moped or scooter accident because of someone else’s negligence, you need to understand what you must do to protect your legal rights. At the top of the list of steps to take to protect your legal interests is to seek assistance from an experienced Dallas personal injury attorney. A personal injury lawyer can help you in a number of ways in the aftermath of an injury causing accident involving a moped or scooter. One of the complicated issues that can arise in regard to an accident and injuries associated with a rental moped or rental scooter is determining who are all of the responsible parties. Ascertaining responsible parties is a key way in which a tenacious personal injury lawyer can assist you following this type of accident. Rental moped and rental scooter companies have been appearing in Dallas and Fort Worth over the past couple of years. Thus far these companies are usually headquartered out of state, primarily in California. If a mechanical defect caused or contributed to an accident, one of these companies is likely the responsible party. Depending on the facts and circumstances surrounding an accident, other potentially responsible parties include the moped and scooter manufacturers, another individual, or even the entity responsible for maintaining the roads and sidewalk. Again, an experienced Dallas personal injury attorney is best able to identify all potentially responsible parties and bring them to justice. Another important way in which a personal injury lawyer can help you in the aftermath of an accident involving a moped or scooter is in taking on the insurance company, or insurance companies. You need to keep in mind that insurance companies are in business for one primary reason only. They exist to make money for their shareholders. By reducing the amount of money paid out in claim settlements each year, an insurance company increases its revenue and profits. An experienced personal injury attorney understands how to handle a defendant’s insurance company. The first step in retaining legal representation following a moped and scooter accident is to schedule an initial consultation with the Law Offices of David Kohm. During an initial consultation, a skilled, experienced personal injury attorney will provide an evaluation of your case. You will also have the opportunity to ask any questions you have about your accident, injuries and how to pursue a claim for your injuries, damages, and losses.